After the success of the first two Professor Layton releases on the DS, it should come as no surprise to see Nintendo localising the third. Its unique blend of mystery storytelling and brain-teasing puzzles somehow forms one of the most unique and engrossing gaming experiences available for the system and a style that's already captured the hearts of gamers the world over. Professor Layton and the Unwound Future will take fans on an adventure through time in one of his most exciting quests so far. But is this newest adventure everything fans of the first two titles were hoping for, and does it carry on the endearing charm found in its predecessors? For those unfamiliar with the Professor Layton titles, the game basically builds an adventure around a classic mystery and allows you to progress through it by solving many brain-teasing puzzles. What exactly the overarching story amounts to we cannot say for fear of spoiling it, and with a tale this captivating, we wouldn't want to risk it. Suffice to say, the storyline is excellent. Each time you solve a mystery, you'll acquire something you need in the game, whether it be an actual item or a valuable piece of information you'll need. As you enter each area of the game, you'll soon learn to use your stylus to touch various objects around the screen to interact with them. You can also move around the various areas with the shoe icon, which will present you with yellow arrows that display the various direction(s) in which you can currently move. You'll also see the Professor's Trunk icon in the upper left corner of the screen that brings up a host of options from which to choose. For example, the Journal icon will give you a rundown of everything you've experienced from Professor Layton's viewpoint. This can be a good feature in case you need to go back and review the game's past occurrences. The Mysteries icon shows you all of the current mysteries you're involved in and tells you whether or not they've been solved. This a good place to look when you're feeling lost and unsure of what to do next. Of course, there's also the Puzzle Index that lists all of the various puzzles you've already solved. You can even go back and play any of the unlocked puzzles at any time throughout the game if you're so inclined. Aside from the main story, there are also a few new mini-games featured in this adventure. The Picture Book allows you the opportunity to place stickers that you earn by solving puzzles in the main adventure onto one of three picture books. As you place the stickers on the pages, the story will change to fit it. Once you fill in all of the story correctly, the next picture book will unlock. Toy Car presents a unique minigame in which you must guide your toy car to the goal while picking up all of the specified items strung around each of the tracks in the process. You'll be given a set number of arrow tiles with which to guide the car and it's up to you to figure out where to place them in order to complete the tracks. As you solve puzzles in the adventure, you'll be able to locate more tracks to play. While these minigames might seem rather silly by comparison to the main quest, they're both extremely enjoyable and a nice diversion from the main game. While the mystery is the meat of the entertainment value, it's the challenging brain teasers that give it its unique charm. These are extremely varied in design and include mathematical word problems, sliding puzzles, mazes and many other tricky challenges for you to solve. Some of these are fairly simple in design whereas others can be quite tricky and will force you to put on your thinking cap if you're to have any hope of solving them. You're also rewarded based on how many attempts it takes you to solve the puzzles. The fewer the attempts, the more Picarats, a type of currency, that you'll earn. It's a good incentive to get you to stop and really think about the puzzles before quickly jotting down an answer. You'll even be able to locate hidden Hint Coins that you can use to purchase hints for times when you get stuck on a particular puzzle. The storyline plays a big role in the progression of the game and will provide you with all of the clues needed to solve the various mysteries. Although it revolves around one main mystery, there are smaller ones that will pop up along the way that you'll have to solve in order to move on in your quest. It's all very well-designed and written, keeping the storyline engaging during your trek. Even the controls themselves are extremely intuitive and make playing easy for gamers of any age. They also allow you to focus your attention on what's at hand instead of fumbling through a host of overly complicated manoeuvres. 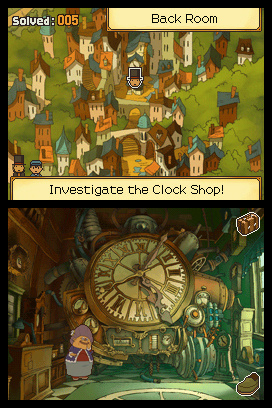 It's clear that the developers knew they were onto something with the original Professor Layton release and didn't try to reinvent the wheel when it came time to put this newest adventure together. There's no denying that the storybook visuals found in Professor Layton and the Unwound Future are impressive. The classic European look of the game makes it the perfect environment for its type of mystery tale and each new area is as visually appealing as the one before it. Even the cutscenes that appear at periodic intervals are very smooth and well animated. The designers obviously put some time into making the game look as good as it plays, and this extra effort really pays off in the finished product. The musical presentation is quite similar to the visuals in the way that it perfectly melds with the other aspects of the game and seems to fit its tone like a glove. There are quite a few amazing musical tracks to enjoy and the voiced dialog just adds to what is an already impressive audio experience. 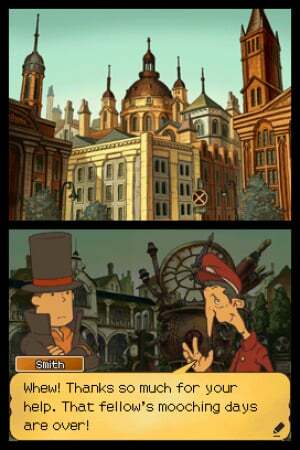 With a title that features a classic European theme like Professor Layton, you'd assume that there would be a risk of overdoing the voice acting, but the developers have somehow managed to keep with the main theme without making it sound forced or overacted. It's every bit as good as the previous releases, maybe even better in places. 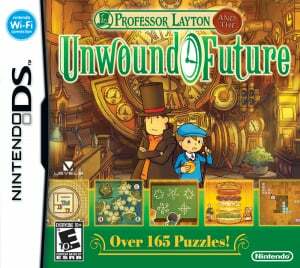 Professor Layton and the Unwound Future doesn't stray too far from the winning formula of the first two releases, and instead focuses its attention on offering up what is easily the best storyline of the series to date, not to mention three of the best minigames as well. It's safe to say that if you're a fan of the franchise, this is a game you absolutely do not want to miss. And if by chance you've yet to experience the series, this enthralling title should offer up all the incentive you need to finally give it a try. I'm so going to get this when it comes out. I love the Professor Layton games! wow, I didn't realise this was coming out so soon. For a second there I thought I was reading a preview! This is probably one of the last non 3DS DS games I am looking forward to getting along with Pokemon Black/White and Okamiden. Can't wait to for the FAQs and lets plays for this game to hit the net. Then I won't even have to play the game to enjoy its story. I have yet to play this franchise yet I'm very interested! Should I get all 3, or just check out the 3rd? I'd check out this one first. Then if you like it, you'll most likely enjoy the others. It's a tough game to put down, I'll say that. This is definitely going to be a day one purchase for me. I loved The Curious Village, and Pandora's Box was only better, so I have high hopes for The Lost Future. They better have kept Luke's British English voice actor - having gotten used to him, I feel he suits Luke's character much better than the lad who does his voice in the American version. Nice review as well Corbie. Can't wait to find out how the Professor gets his hat! Picking up my copy in about an hour. Glad to know you guys enjoyed it! I haven't played any of the games yet. Should I start with this one or another one? Great revw Corb-meister. Huge Prof Layton fans in my household. Insta-buy all the way. Heck, preed from a long time ago actually. Whoa, it comes out today! I'm buying this after I finish church!!!! @EggMiester: Yes, while some of the puzzles can easily stump the player, I think that at the same time, it makes the game extremely rewarding. I remember in the other two games, there were times were I spent quite some time on just one puzzle, but getting it right on that first try gave me a feeling of accomplishment that I don't usually get with most games. I haven't played the first two games at all, Nintendo should release a Professor Layton Collection, three game cards for one price. Didn't even know this was out. Need to get this. I never played the second. Ive beaten and have the second one i intend on getting them all. Ill propally start with curious village before i go and play this one. That reminds me that I need to finish Diabolical Box. I'm amazed that Level 5 can come up with so many puzzles for each of the Professor Layton games each year! Those guys are geniuses. I'll be picking this up when it hits Europe on the 22nd October. The first two were awesome!! LOL, there are three minigames, but I'm not going to tell you about the third one. You can find it on your own. It's worth the wait, at least for me it was. Oh Boy, another game I need to spend money on. It's time to kick *ss and solve puzzles... and I'm all outta *ss. @14 These games are very rewarding. To me the reason is because when I finally solve a puzzle I feel smart because I figured something out. It is a nicer reward than killing all the monsters in a room (even though that can be fun too)! I'm surprised that this one came out so soon. It felt like forever waiting for the Diabolical Box to come out. I absolutely love the Professor Layton series. The first two games were excellent so I'm very much looking forward to playing this one. They always leave me wanting more but this game should keep me busy until the next one comes out. Great review Corbie. Nice! I just finished the first one a few days ago (loved it) and haven't gotten the second game yet, so I don't mind waiting for a pricedrop for the third game. I hate that we're not getting an English version here in the Netherlands though, so I'll have to import. I think what I might do is buy Shattered Dimensions at Toysrus and get a free $25 gift card, then use that to buy this game. Can't wait. Can't wait. Can't wait. 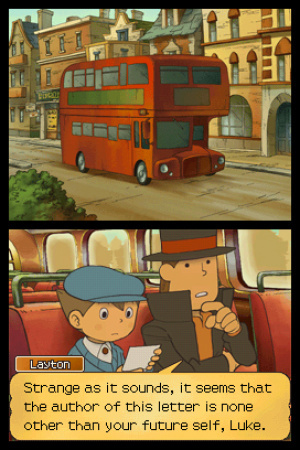 Everyone needs to play Professor Layton. Does this game have more "mechanical" style puzzles than found in the previous games? I only played the first. Too many "riddle" style puzzle for me. Level-5 stole my heart away from Square-Enix as my favorite developer since playing Dark Cloud on the PS2. I'm glad to see their success on that platform transfer over to the DS, with four games with a ranking of 9/10 on here and a metacritic aggregate of 84+. They're so good at what they do, Squenix used them to develop DQIX. Hopefully they'll develop a little something for the Wii! I can't wait to get this game. I loved the first 2, and this one sounds even better. "Forget it Luke. Its Chinatown." never played any of them but boy do I want it!!!!!!!! Like all Layton games, the ending made my cry. Hey, it WAS pretty sad!!! This is going to be so awesome. Can't wait till it arrives in my mailbox. Solved all 168 puzzles and mysteries, because a true gentleman never leaves a puzzle unsolved! Hang on, how come there's future Luke but no Professor unless he's..dead? This game has that addictive factor to it that makes you not want to stop playing once you start. I absolutely love it! Definitely a 9/10 or 10/10. Also, great review! Just bought it yesterday with a gift card. I've wanted it for a while. 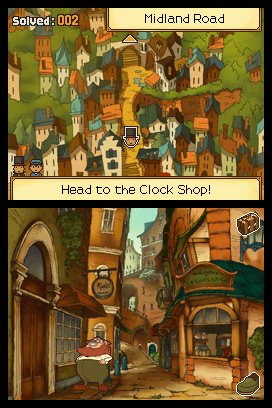 It's my first Professor Layton game and although I've only played a few hours so far, I've loved it.